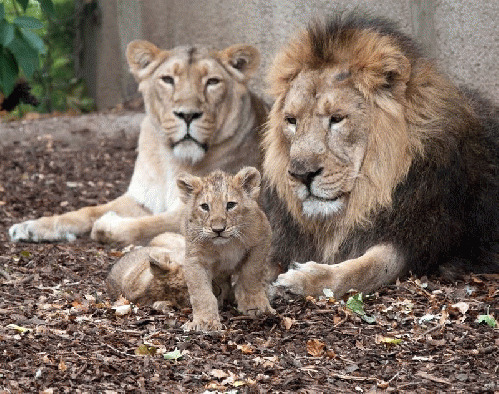 A family of healthy lions was killed by the Copenhagen Zoo. The human beings who run the Copenhagen Zoo apparently have a single-minded approach to managing the institution: If the animals trapped in their breeding program do not measure up to the humans' arbitrary standards (too old, too young, too weak, too common), the animals are killed. which the humans apparently think sounds better but doesn't make any difference to the animal involved. Dead is dead, however one tries to gussy it up with phony, save-the-species kind of language. And dead for no good reason is, at heart, cruelty. In March, the Copenhagen Zoo bosses killed a healthy, 18-month-old giraffe, named Marius, because, they said, his genes were not needed in their breeding program. He was surplus. They rejected offers from other zoos to take Marius and shot him in the head with a bolt gun, dissected him front of a crowd that included young children, and fed his remains to the zoo's lions. The cubs, like Marius, simply had the misfortune of being born at the Copenhagen Zoo. They were killed because the zoo had its eye on a young lion at another Danish zoo that it wanted to mate with two younger females at Copenhagen, to create a new pride. The females are offspring of the deceased male and the zoo officials said they wanted to avoid in-breeding. They also said the young male they had their eyes on would just kill the young cubs anyway, so bye-bye. Apparently, sterilization or merely swapping healthy animals between zoos to let them live out their lives are concepts that do not fit into the breeding program of the European Association of Zoos and Aquaria, to which the Copenhagen Zoo and 345 or so others in Europe belong. The Copenhagen Zoo said it had no offer to take the lions off its hands, but its treatment of Marius shredded any credibility on that count. In addition to rejecting an offer from another zoo to take the giraffe, the zoo speeded up his execution in response to a petition signed by tens of thousands of people around the world to spare him. When Marius was killed, the corresponding zoo association in the United States said such a thing would never happen in this country because the zoos sterilize or swap healthy animals. That's instead of killing them for expedience, or budget-balancing or ego-satisfaction or whatever is driving the men in charge in Copenhagen. Certainly, it's hard to believe animal welfare enters into their calculations. Zoos are ostensibly a means to protect and preserve species of animals on this planet and to expose and educate millions of people about the beautiful diversity of wildlife most of us would never have the opportunity to witness. But grabbing animals from their native habitats and breeding them in captivity, for whatever stated reasons, does not give humans the right to mistreat the animals, to cage them and treat them as entertainment, or to regard them as some kind of laboratory experiment which can be discarded in the name of science or conservation. What the Copenhagen Zoo (and others that operate under the same principles) does has nothing to do with wildlife conservation, humane education, or respect for animals. It is strictly about the convenience of the humans. EAZA said it "regretted" the deaths of Marius and the lions, but that the Copenhagen Zoo has been consistent in its approach and broke no association rules. That's lame and, frankly, it should be embarrassing to other members. It is time for zoos in Europe and elsewhere to rethink their mission and find more humane, compassionate ways to go about meeting it.